Casting is the process where metal is heated until molten. While in the molten or liquid state it is poured into a mold or vessel to create a desired shape. Forging is the application of thermal and mechanical energy to steel billets or ingots to cause the material to change shape while in a solid state. solid is melted, heated to proper temperature (sometimes treated to modify its chemical composition), and is then poured into a cavity or mould, which contains it in the proper shape during solidification. Thus, in a single step, simple or complex shapes can be made from any metal that can be melted. or hot-working temperatures with processes such as forging, or it is done at cold-working room temperatures with processes such as stamping or bending. The traditional method of obtaining the casting geometry is by sending blueprint drawings to the foundry. This is usually done during the request for quotation process. However, more and more customers and foundries are exchanging part geometry via the exchange of computer aided design files. The pattern is a physical model of the casting used to make the mould. withdrawn, its imprint provides the mould cavity, which is ultimately filled with metal to become the casting. additional patterns, referred to as cores, are used to form these cavities. Cores are forms, usually made of sand, which are placed into a mould cavity to form the interior surfaces of castings. Thus the void space between the core and mould-cavity surface is what eventually becomes the casting. aggregate around a pattern held with a supporting frame, withdrawing the pattern to leave the mould cavity, setting the cores in the mould cavity and finishing and closing the mould. Cleaning refers to all operations necessary to the removal of sand, scale, and excess metal from the casting. The casting is separated from the mould and transported to the cleaning department. Burned-on sand and scale are removed to improve the surface appearance of the casting. Excess metal, in the form of fins, wires, parting line fins, and gates, is removed. 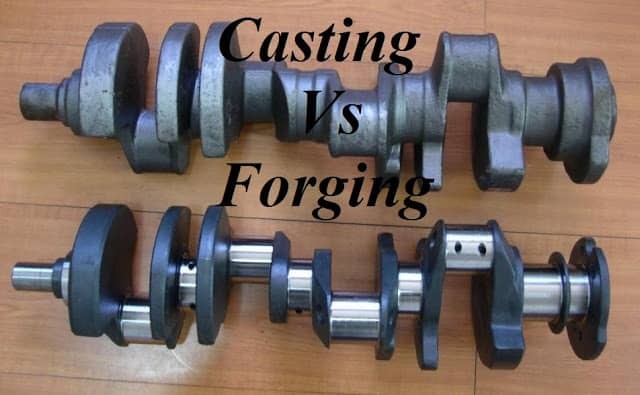 Castings may be upgraded by welding or other procedures. Inspection of the casting for defects and general quality is performed. Processes that cause changes in the shape of solid metal articles via plastic (permanent) deformations. section area and shape while being pulled through a shaped converging die. through the opening, usually being pushed out by a mandrel. workpiece is placed between an anvil and a hammer and subjected to compressive force between them. 1) the most intricate of shapes, both external and internal, may be cast. As a result, many other operations, such as machining, forging and welding can be minimized or eliminated. of several pieces if made by other methods. to the requirements of mass production. Large numbers of a given casting may be produced very rapidly. 5) large and heavy objects may be cast when they would be difficult or uneconomic to produces otherwise. 2) strength and lightness in certain light metal alloys, which can be produced only as castings.